When your child has a cough and congestion, offering relief can be challenging, especially if your child is too young to take an over-the-counter cough medicine. One safe suggestion you’re likely to hear from your provider is add more moisture. 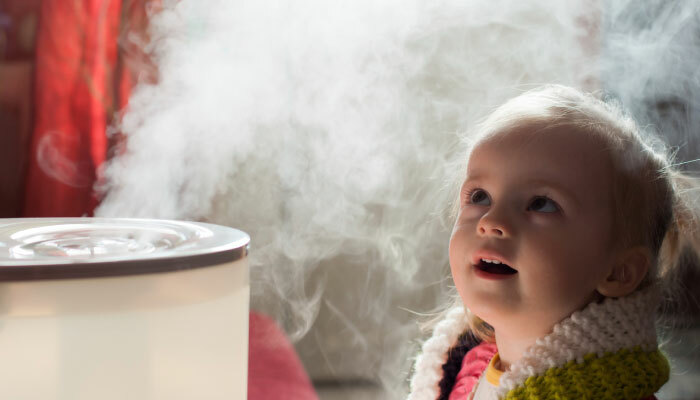 Pediatrician Vikram Agrawal, MD, FAAP, UnityPoint Health, explains humidifier benefits and how adding moisture to the air in your home can help ease your child’s discomfort. One way to add moisture to your home is through a humidifier. There are three, broad types of humidifiers. “A central humidifier is enough for summer and spring, but for the drier months, like winter, you’ll need an in-room humidifier,” Dr. Agrawal says. Dr. Agrawal says cool and warm mist humidifiers are both effective at adding moisture to the air. However, cool mist humidifiers are considered safer for use around children and pets, because warm mist humidifiers boil water, then release the steam, which can cause burns. Dr. Agrawal says if you’re using it in your child’s room, place it near a bed and turn it on about an hour before bedtime. “Congestion is typically caused by inflammation in the sinuses or the airways, trapping mucus and causing complications. Keeping congestion under control can help prevent secondary infections and sinus headaches. An important aspect of maintaining healthy sinuses is the amount of humidity in the air. Humidifiers increase the humidity and relieve cold and sinus congestion. Using humidifiers for congestion can also help in properly drain sinuses,” Dr. Agrawal says. Dr. Agrawal has these suggestions for those who are trying to purchase the correct humidifier. First, choose one that’s the right size for your child’s room. A humidifier that’s too large can create condensation, which could cause bacteria and mold to form. Second, look for a model with an automatic shut-off feature, should the reservoir run dry. Third, use filtered or distilled water, if possible. Tap water contains many minerals that can provide a breeding ground for bacteria inside your humidifier. Finally, keep your unit clean. For humidifier care, Dr. Agrawal suggests soaking the tank and all parts exposed to water in a 10 percent bleach solution (one part bleach to nine parts water). He also highly recommends emptying the water tank and drying interior surfaces every time you turn off the machine. Then, refill with water right before use. “You should clean your humidifier every 2-3 days. Bacteria and mildew can grow in standing water in a dirty humidifier and worsen the present condition or even cause a new illness,” Dr. Agrawal says.